To help accelerate the construction progress on Court E, we are adding additional staff to this project to assist with the construction. However with that said, some of our work has been accelerated. Most notably is a water shut down that we need to perform this Wednesday, October 29th. 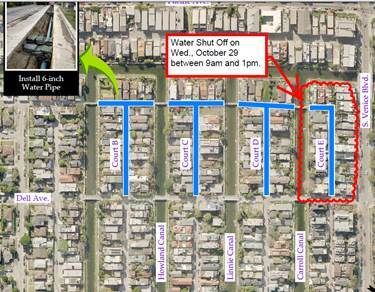 This email is to advise that residents in the 200 block of Court E and Grand Canal will not have water this Wednesday, October 29th between 9am and 1pm. Water will be restored by 1pm. Again, this only pertains to customers in the 200 block of Court E.
All other work will continue as normal, but with the addition of more staff, we will accelerate the pace. Venice Canals Duck Race & Downwind Regatta 2012 from Michael Town on Vimeo.